Today is my big sisters 12th Anniversary of her 29th Birthday. She is four years older than me and I remember when we were growing up she turned 13 on Friday the 13th. She had her picture in the paper. When they came to take her picture she wsa wearing this big courdroy jacket and had her roller skates tossed over her arm. We were BIG into roller skating back then (there wasn't anything else to do) and my parents had arranged a Skating Party at the local rink, whoo hooo a real party! Well her picture was in the paper that Friday and she was an instant celebrity and wouldn't you know it, it snowed! And it snowed....and it snowed.....almost to the point where the party was almost canceled. But we persevered and drove through that blinding blizzard to the rink and skated around in circles for hours, and we were happy about it! I called my big sis today to wish her a happy day and we were talking about the whole Friday the 13th thing and she said, "I even think it's a full moon tonight, how cool is that?" I looked it up on the internet and it's actually tomorrow (what a bummer) but she was really bummed about it. I didn't think anything about it really. We had a little chat and since I was at work had to run but wished her a happy day. My sister really is a witch! 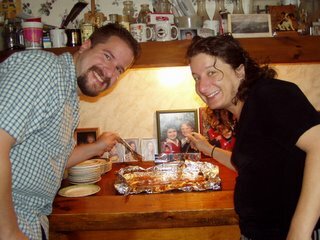 Happy 29th(+12) Birthday Michael's Sis! haha, witchy sister happy birthday!! Happy 12th Anniversary of her 29th Birthday Michael's sister!